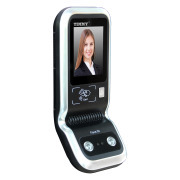 Face ID-A2 adopts the most advanced facial recognition algorithm for access control and time attendance. The double high-definition infrared camera are able to detect the biometric face and turn into working mode immediately from resting mode to save power. The biometric detection technology prevents the verification of photo and anti-dismantle function is included, which ensures the high security level. With standard Wiegand interface and optional wifi function, Face ID-A2 is technically management-friendly.